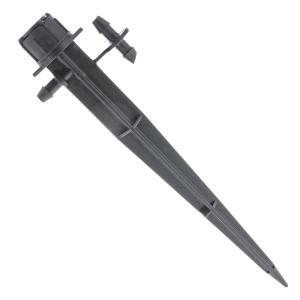 Adjustable Mini Bubblers are available with 1/4" barb mounted on a 6” stake and are designed to produce a gentle umbrella pattern for rapid watering near the root zone with adjustable flow rates from 0 to 31 GPH and a diameter range from 0" to 18” at 30 PSI. Each Mini Bubbler has an adjustable cap that allows for simultaneous control of the flow rate and the wetting area. Mini bubblers are suitable for pots, tubs, planter boxes, landscaped gardens and nurseries when you need more water in a short time. Use under roses where direct watering avoids wetting of foliage. Ideal for street trees and palms. Flow to individual plants can be adjusted or shut off. The adjustable mini bubbler offers a convenient way to water areas where conventional sprinkler systems are not suitable. 2 4.0 GPH 0" 5.0 GPH 0" 7.0 GPH 0"
4 7.0 GPH 0" 9.0 GPH 0" 11.0 GPH 0"
6 10.0 GPH 0" 13.0 GPH 0" 15.0 GPH 0"
8 13.0 GPH 0" 17.0 GPH 4" 19.0 GPH 6"
10 16.0 GPH 4" 20.0 GPH 6" 23.0 GPH 9"
12 19.0 GPH 6" 23.0 GPH 9" 27.0 GPH 13"
14 22.0 GPH 9" 27.0 GPH 13" 31.0 GPH 18"